Author and poet; born Aug. 4, 1862, in Munich, Germany. He is a grandson of the rabbi Hirsch Aub, of Munich. When his father, Max Aub, a lawyer, was recalled to Munich from the little town of Uffenheim, Franconia, where he held an office under the government, Ludwig entered the gymnasium of his native city. From early boyhood he gave evidence of that all-absorbing love for books which afterward led him to seek employment with different firms of book-sellers in Vienna and Leipsic, until he himself became a dealer in rare books. This occupation gave him a comprehensive knowledge of modern German literature and, at the same time, put him in touch with men calculated to stimulate his literary tastes. Unfortunately a serious affection of his eyes not only forced him to give up his business, but has seriously interfered with his literary career. Aub has occasionally championed Jewish interests against anti-Semitic attacks. 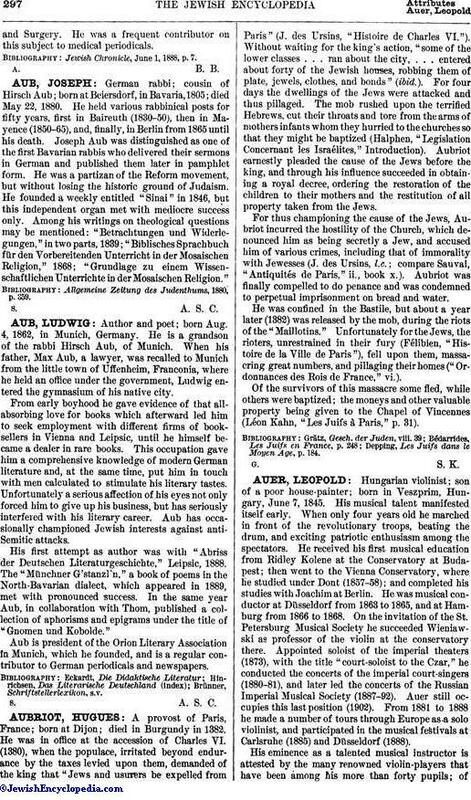 His first attempt as author was with "Abriss der Deutschen Literaturgeschichte," Leipsic, 1888. The "Münchner G'stanzl'n," a book of poems in the North-Bavarian dialect, which appeared in 1889, met with pronounced success. In the same year Aub, in collaboration with Thom, published a collection of aphorisms and epigrams under the title of "Gnomen und Kobolde." Aub is president of the Orion Literary Association in Munich, which he founded, and is a regular contributor to German periodicals and newspapers.